The next time visitors you’re hosting want to see the Smithsonian National Museum of American History again, don’t bother going inside. 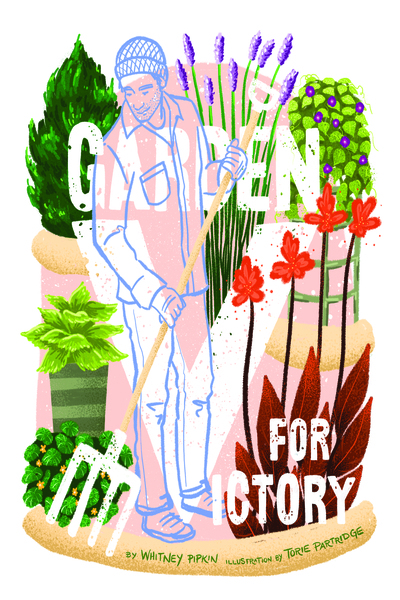 Instead, head over to the east lawn of the building to glean plenty of history—and food-growing wisdom—from the immaculate Victory Garden and its knowledgeable keeper, horticulturist Joe Brunetti. Unlike the neglected one floundering in pots on your back porch (just me? ), this garden harkens to a time when growing food was more necessity than hobby. Planted across the country during World War II, Victory Gardens made good use of empty lots and grassy front yards as civilians worked to ensure an adequate food supply for troops abroad and at home. More than 20 million Victory Gardens supplied close to 40% of the country’s food during a peak in 1943, Brunetti adds. At the garden he runs in memory of that era, production isn’t as important as poignancy. Sesame seeds and bird peppers find a place not because they’re a necessity but because they have a story to tell. Lush cardoons and purple hyacinth beans add beauty and dimension to the landscape, while strongly scented herbs help drive pests away—instead of the chemicals they used in the 1940s. Though almost all the varieties planted in the Victory Garden would have been available during World War II (the better-tasting Cascadian hops notwithstanding), the pressures Brunetti faces to grow them have stood the test of time. Birds and squirrels like to wait until his Arkansas Traveler tomatoes are nearly ripe to peck a hole in them or drink their juice. Invasive bug species lay eggs on the underside of leafy greens and nibble on the hibiscus blooms. But the Victory Gardeners would have faced those, too, without the help of modern varieties, so it feels fitting. We talked to Brunetti about what this blast-from-the-past garden still has to teach us. Edible DC: What do people ask you when they’re wandering in the Victory Garden? We have it here. Yes, it existed and people had the option of getting seeds and growing it. But were people really worried about supplying sesame plants for their families? No. I also get people saying, “I didn’t know it grew like that,” and then I get to tell them the story: When the pods turn brown the plant spills its seeds, which is where the term “Open sesame” came from. But modern varieties are bred to keep their seeds in place. EDC: What unique opportunities come with running a garden at the Smithsonian? JB: Well, we grew Cascade hops in the garden this year, and we have a beer historian inside. She is working with Charlie Papazian, who is the godfather of home brewing in this country. He started the Home Brewers Association and wrote this book that is a bible for home brewers. So we did. He’s brewing a special beer with our Smithsonian garden hops that we’ll serve at an event in December. EDC: Have you had people who lived through World War II visit the Victory Garden? JB: Yeah, in the past. They’d be in their 80s and 90s. When they hear about it being a Victory Garden, they get more nostalgic about the memories of that time and the stories being told through the plants. They really just appreciate that it’s still being talked about. When they see us growing some of the crops—if I’m growing, say, a type of tomato that somebody during the war was growing—it’s just the nostalgia, the happy memory of it. And most people love talking about canning. That was a huge learning curve: How do you take all this food we’re growing and how do I get my family through the winter? Cabbage, potatoes, gourds were all key. And then the tomatoes and beans had to be canned. I think the canning stuck with people, because there was a very real fear of contaminating your family, or not being able to feed them. EDC: Was the Victory Garden era the peak of American gardening culture? JB: Yeah, food security was big. A big part of the gardens was being able to free up enough food to send some to our troops and Allies, and then every man, woman and child could contribute to the war effort by planting their own garden in their backyard or on their balcony. It could be as small as one tomato plant in a pot on the fifth floor in New York City, or it could be a multi-hundred-acre farm. The size didn’t matter, it just mattered that you were trying to contribute and grow your own food. EDC: How do you define heirlooms for your purposes? JB: The beauty of heirlooms is not only do they tell all these stories, but we’re keeping that genetic diversity alive. It gets tough to define, though. If a plant is open pollinated, you can call it an heirloom by the true definition. Some people say it has to be 50 or 100 years old. I don’t like dates because if you’re putting a certain date cutoff, every year we advance. What’s happening to that cutoff date? There can be something that’s technically an heirloom because it’s open pollinated, but it came out in the ’80s. Like the Green Zebra tomato. People think that’s super old, because it’s technically an heirloom. It turns out, the word heirloom is very loaded. Virtually every nook and cranny in the modest space behind Seng Luangrath’s house is devoted to growing a vegetable or herb of some kind. Some are nestled into big pots. Others emerge from long rectangular plots that have supplanted the lawn or that abut the fence that lines the property. I kneel down to take a closer look at a row of mint at my feet. “Mint comes back every year,” Luangrath tells me. “We don’t have to worry about it too much.” The mint is used in making laab, a Lao minced meat salad that showcases fresh herbs. Laab is just one of the dishes at Thip Khao, Luangrath’s 2-year-old restaurant in Columbia Heights, that benefits from what’s grown in the garden. Thai basil, another frequently used herb that graces many of the dishes on the menu, including laab, is found in a nearby plot where it’s grown from recycled stems rather than seeds. Because Thai basil of good quality is easy to obtain from suppliers, less space in this garden is committed to it. Instead, more space is devoted to growing Thai chili peppers. The two plots adjacent to the mint and Thai basil feature newly planted ones. Once picked, they’ll be used to add heat wherever it’s called for on Luangrath’s menu. Luangrath is careful to point out the distinctiveness of her chili peppers, which are red, more slender, drier and produce a more potent pith and rib of interior seeds. Another garden mainstay found in the rich stews at Thip Khao are kaffir lime leaves. The unique leaves, always appearing as a connected hourglass-shaped pair, are intense but more rounded in flavor than conventional limes. Obtained from a thorny tree, the leaves, sliced to release their essence, are an indispensable ingredient. Luangrath’s kaffir lime trees are planted in pots, ones that she transfers from her greenhouse to the rear of the garden once spring has arrived. While actual kaffir limes—with their characteristically pebbly skin—are nearly impossible to grow here, the trees produce a bounty of leaves. “Look,” she says. “Here’s our big tree.” Luangrath shows me a large kaffir lime tree, neither dainty nor slight like the rest, with tall branches that she must stretch out to reach. Having braved fluctuations of weather and thrived for decades, this one’s become a family heirloom. Luangrath’s backyard garden dates back to 1993 when she and her husband, Boun, bought this house in Northern Virginia. That was 17 years before assuming ownership of Bangkok Golden, Luangrath’s first restaurant, in Falls Church—a Thai restaurant, offering mostly Thai classics, that’s still going strong today. There, first as specials and later on a “secret menu” whose rewards spread quickly by word of mouth and online chatter, Luangrath introduced her native Lao food to the public. It caught fire. Thip Khao followed in 2014. The garden—an expression of a longtime practice dating back to Laos, where Luangrath grew up—became, as circumstances dictated, a source of ingredients for the restaurants. But as a source of pride and identity, the garden would still exist even if Luangrath didn’t own two successful restaurants. Luangrath also remembers having a papaya tree that allowed for the freshest papaya salad and coconut trees that supplied fresh coconut milk. The tropical weather was conducive to growing all manner of tropical fruit—ones that the climate in Northern Virginia simply can’t support. Luangrath had tried growing papaya, longan and guava in her garden here but to no avail. “Now, we just focus on whatever we can grow.” That focus has resulted in harvesting leaves rather than fruit. A betel nut tree is one case in point. Dark green and oval in shape with a sharp point, betel leaves are an integral part of a dish called mien muang luang (rice paste wraps). Luangrath uses the leaves to hold the pounded sticky rice, which is eaten by hand. Luangrath’s guava tree, ever fruitless, produces leaves that end up in guinea fowl soup where the long, blunted green leaves, once steeped into the broth, add a dose of umami. There are other flourishes in the garden as well: rows of cilantro and lemongrass, dangling strands of purple and green snake beans. Now, toward the end of the growing season, there are even occasional kabocha squash, which are green on the outside, small and squat. Bobby Pradachith, Luangrath’s son and a 2014 graduate of the Culinary Institute of America, came on board last year to be her co-chef at Thip Khao. He had worked most recently at Minibar by José Andrés, honing his craft and learning the finer points of molecular gastronomy. The chance to partner with his mom was a calling that he couldn’t pass up. It meant that he could shoulder some of the burden of running the family business but also, as a first-generation Lao-American, discover an important part of himself through the food. Since his arrival, he’s become the de facto manager, supervising the front of the house, and an all-purpose specialist in the back of the house: cooking, doing prep work and, yes, thinking about how to best utilize the resources of his mom’s garden. Pradachith has his mom’s Thai bird’s eye chilies on his mind. And, while one would think having a plethora of actual chilies would diminish the importance of the leaves, that’s not the case. Despite how uniquely he employs the chili leaves, it’s another type of leaf that fascinates him the most. “I’m kind of obsessed with ginger leaves,” Pradachith confesses. Ginger root is well known for its use as a spice and seasoning throughout Asia—ginger leaves not so much. The slender leaves, about a hand’s length, tapering to a gentle point, look vaguely like the head of a spear. Unlike the root itself, which is peppery and can be astringent, the leaves are mild and somewhat sweet while still possessing the essence of ginger. Pradachith loves how it complements fish—leaving a gentle gingery quality that’s less harsh than the flavor imparted by the root. And, unlike banana leaves, which are discarded once they are unwrapped to reveal the fish, ginger leaves soften when steamed and can be eaten. Perhaps one of the most unique herbs in the garden, Luangrath points out to me last. She pauses to remember its name. “It’s called fish herb or fish mint, I think” she says. As I press the broken piece to my nose, the aroma wafts out and smells incredibly and distinctively of fish—amazing.